In this review of Nitro Productivity Suite I’ll run through some of the features I use the most, like edit documents, print to PDF, sign documents and a few other functions and show how easy they are to use. Nitro Productivity Suite includes both Nitro Cloud, the online element, and Nitro Pro 12, the desktop element. Firstly, I accessed the 14 day trial version for this review. It downloaded and Installed in just a couple of minutes. Startup was quick and didn’t leave me hanging like some other PDF software does. This is a feature I use a lot with PDF software. 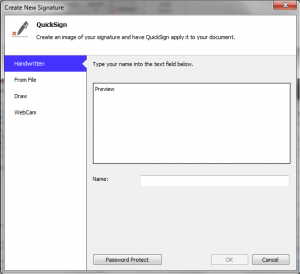 With Nitro Pro 12 it’s easy to upload multiple new signatures so documents can be signed by various people. These can be password protected for extra security. You can quickly manage and delete any signatures you don’t want anymore. 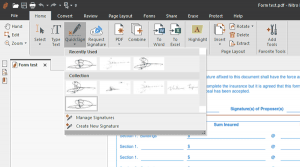 When you’re ready to use a particular signature just click the QuickSign Button and select it. 1) Upload a file. If you already have a signature scanned then this is probably your best bet for clarity and sharpness. You could take a photo of your signature on a nice white piece of paper and save it. 2) Webcam. This is a really quick and useful option if you don’t have a stored signature. Sign a piece of white paper with a black marker and then hold it up to your webcam and it takes a fairly good image of your signature. It took a couple of goes to get the right signature size and thickness of marker but within a couple of minutes I had a very usable option. 3) Handwritten option. 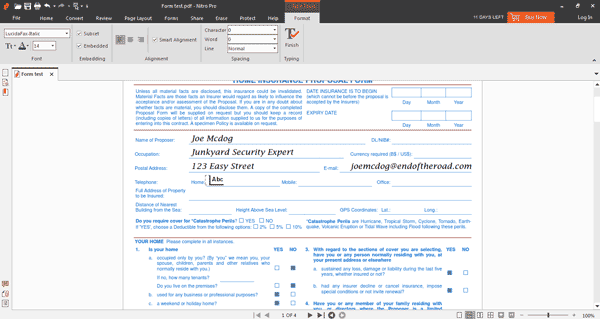 Simply by typing your name it will insert your name in a generic “signature” style. 4) Create a digital signature using a mouse and the online writing pad but find that this always looks very ‘80’s digital so would rather go for the other options. 4)	Select the fields you need filled from a drop box and drag them into place. Most common would be name, date, signature, position etc. 7)	Once it’s signed it marks the document as complete and sends you an email. Done and dusted!! This is another feature of PDF software that I use frequently. I’m often sent documents by insurance companies, associations or memberships and a whole host of others. I try to keep my office as paper free as possible so I don’t like to print them out unless they have to be posted. In addition, if I fill in the forms digitally I can correct any mistakes easily. 5) You can still edit the text even after you’ve saved and closed a document. Some other PDF editors don’t support this so you’d have to use the erase tool to get rid of incorrect text before refilling the fields again. I probably use this feature more than any other, specially around tax time when I need to get all my invoices together. Since I buy almost everything online I have digital receipts often just in email form or sometimes within the supplier’s website. If the invoice is not already in a PDF I just open it, press the Print option in my email or from the website and select Nitro PDF Creator in the dropdown list of printers. Then it asks me where to save it and it’s done, simple as that. The PDFs are high quality and now I have virtually no paper receipts in my office any more. I also create PDFs from Word documents in the same way when I want to send them out in a more professional way. So easy. Occasionally when I receive a large PDF and would like to edit it, typically to summarise a study course I’m part of, I like to convert the document to Word first and then remove all the excess information. Converting in Nitro Pro 12 was so simple and really accurate too. I just opened the PDF and pressed the Convert to Word button in the toolbar. I could choose to include specific pages only and also to save in the original file location or in another location. The conversion took less than a minute. Afterwards all the images were still present, the formatting was pretty close, maybe a few extra paragraph spaces but otherwise good. Very impressed over all! Nitro Productivity Suite has a very similar layout to Word and Excel so if you’re an Office user you’ll have no problem working it out very quickly. The help section has a user guide, knowledge base and community forum so you’ll find answers to most of the common questions and issues. It has everything that I have ever needed when creating, editing, signing and converting PDFs so I’ll give Nitro full marks on available features. Given that Adobe Acrobat costs more for just one year than Nitro Pro costs to purchase outright it’s a brilliant price. It costs about the same as some other PDF editors of the same quality and feature list. 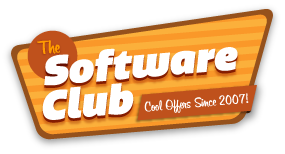 The price includes a 1 year subscription to Nitro Cloud, where you can store, share and request signatures easily. We don’t have details on the future cost of Nitro Cloud yet. You will need to cough up extra for Nitro VIP Access, which allows you to submit support tickets, but you’ll still have access to the Community Support Forum, Knowledge Base, and how-to videos without any additional payment. 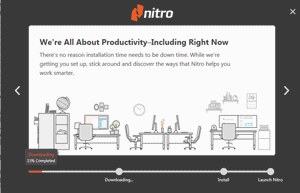 Where can I buy Nitro Productivity Suite? You can buy it directly from Nitro from anywhere in the world. With instant download you can start using it right away. If you purchase more than 2 units at the same time you can get up to 10% discount off the standard price. No coupon needed. If you already own Nitro 10 or 11 you can upgrade at a much lower price, around 60% discount.